The idea for this trip actually started over a week ago when Greg got a bunch of people together to climb North Ingalls Thursday Oct 4th however that trip fell through so he rescheduled it for the next Thursday. I had mentioned I may be interested to Greg but I didn't plan to go until just a couple days before when I knew I could get off work. This was perfect since everyone needed someone to be able to lead the climb and with Josh climbing Columbia Peak that day, North Ingalls wouldn't have happened of I didn't jump on at the last minute. Amazingly, this would be one of the last peaks Greg and Fletcher have to climb in the whole Teanaway area. Props to them for nearly climbing them all! This peak was interesting to me since I would have never thought to climb it since it falls short of being a Bulger but I put aside my quest for the Bulgers for a good technical climb. I just had to. I have never spoke with Rob and Fletcher before so they were a little concerned but Greg made a great mediator for planning the trip. I mentioned we should meet at 5am and after getting around 3 hours of sleep the night before we were off. We all met at the Issaquah Park and Ride and loaded in my car. The drive was nice and in a couple hours we reached the Teanaway trailhead just before sunrise. So we started up the Ingalls Pass trail to a beautiful sunrise with our ambitions high. The hike to the pass went quickly since we had been talking the whole way.It was great to finally be able to meet Greg since Josh had been telling me about him all year. Too bad he couldn't join us today but he had fun further west. Once at the pass we took a break and I was in awe at all the larches that were peaking. I had just seen my first golden larch a couple weeks before and this was the first time I saw so many of them (I know its sad as I lived in WA nearly all my life). However since I had been in Colorado the last 4 fall seasons I only saw aspens (which are freaking amazing though!). We took our sweet time hiking through Headlight Basin and taking lots of photos. Rob had his nice Canon 40d SLR with him as well which he was able to take great photos. We continued on the easy trail and reached Ingalls Lake at about 9am and took another break to fill water and take in the beauty. This was my first time to the lake despite having hiked to Ingalls Pass twice before. We hiked around the lake to the left and crossed some slabs to the large talus gully that led straight up to the saddle. At times there was a boot path up this talus slope but the rocks were mostly pretty solid. We reached the saddle and decided to stash gear in a small cave just below the saddle. Here we all changed shoes, put harnesses on and I gathered up all the pro and readied the rope. I was easily able to spot the first pitch about 30 feet below the east side of the saddle where some slings were placed. We all walked to the base and the climbing began! With the four of us at the base of the first pitch, I went over with rob how to lead belay and reviewed with everyone how to tie in. Once everyone felt comfortable I began climbing. It started out as an easy 3rd class scramble up an open book to get to the base of the actual 5th class climb. After about 40 feet of 3rd class I reached the first big crack. For some reason I thought it would be better to stay along the spine of the open book and I found myself at the base of a small chalkstone where the easiest way up was through a hole I wasn't going to fit through. Therefore I had to think for awhile about where to go. To the left of the ghalkstone was a vertical smooth wall and to the right was some smooth slabs with small cracks. I ended up climbing a 5.7 move to reach the top of these slabs where the first big ledge was located. In hindsight, I should have stayed further right and climbed up the easy big and well worn crack that I didn't even need to protect. Anyway, once I got up I anchored myself in to the slings and belayed Rob up, who had to climb my ascent route to get the gear. Fletcher then scrambled up to the base of the crack and I was able to throw the rope to him. He climbed the big crack easily. Greg who didn't want to scramble up the first 3rd class section unroped stayed at the very bottom near our gear stash. I wasn't able to throw him the rope so I rapped down and gave it to him. Rob then belayed him up the whole pitch and I soloed back up. We were then all up the first, easy pitch and looking up at the second pitch got me a little worried since the belay ledge was pretty small. Four people would have been a problem but just as Greg reached the top of the big crack he said he was done and would wait. I felt bad he wasn't able to make it but after climbing it I now realize that it would have been very hard to try and get 4 people up because 3 was hard enough. We re-grouped and I prepared to lead the second pitch. I told myself I was going to stay on route this time! I'm off route too far left! Looking at Mount Daniel from the belay ledge. Looks like a 65 degree incline to me! I began climbing with Rob as my belay and a short move got me to the big ledge above the meat of the climb. I didn't see any anchors of any kind here so even if you had a longer rope you would still have to belay from the small ledge just below. I then followed the open book to the left of the nearly vertical, white colored face and mantled up to the top where I reaches easy terrain and another anchor. This pitch went very fast and I belayed Rob up. He made it up nicely and after a few attempts as tossing the rope I managed to get it back to Fletcher who then made it up. We then walked the easy terrain to the summit which had a cool slab to climb over. We were all excited and we couldn't have had better weather. Views of all the Alpine Lakes Wilderness area as well as the Stuart Range were beautiful. We relaxed, took photos and yelled down to Greg who answered with his cry. It's is likely we are the last people to summit North Ingalls in 2012 since we were there on the last dry day of the year! It came the time to head down. We scrambled down back to the top of the last pitch and I reviewed with Rob and Fletcher how to rappel. I set the rope through the anchor and Rob went first, then Fletcher then me. Back on the small belay ledge, I had to pull the rope, and feed it through the chains. Lets just say it was a tight fit. We all made it down the second pitch smoothly but I should mention that if you have a 60 meter rope you will need to walk to the east side of the face (skiers left) or the rope will not be long enough. There is another set of slings here but once you reach the ledge just below the face the smaller slab that leads back to the big ledge at the top of the first pitch can easily be scrambled down on the far east side. We met up with Greg again and I set up the final rappel. We all made it down and back to our gear stash. From here we decided to split up for the hike back to Ingalls Pass. Rob and Greg would return down the talus slope and back to the pass on the trail through Headlight Basin (the way we came) while Fletcher and I would run the ridge over South Ingalls and Fortune Peak. So off we went...Fletcher and I made quick work up the 3rd class scramble to South Ingalls Peak and had great views of the climbing route. The lighting was getting very good later in the day. We continued down the other side of South Ingalls and traversed the ridge to Fortune Peak. This traverse was mostly class 2 with a couple 3rd class spots to get through some notches. Soon we found ourselves on Fortune Peak with great views of Mount Stuart. We continued down the ridge back to Ingalls Pass where we waited for Rob and Greg. 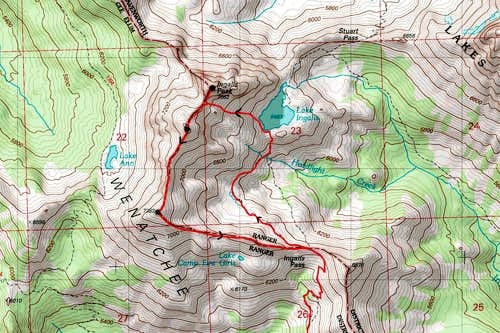 Fletcher decided he wanted to also run up Not Hinkhouse which is the unranked peak between Ingalls and Longs passes. I just waited at Ingalls Pass and watched the sumset. Soon, all four of us met back up and continued down the trail back to the car. The sunset was stunning and we saw Mount Rainier to the south on the hike down. About halfway back to the car from the pass we were benighted and had to pull out the headlamps. Upon reaching the car is was unanimous that we would get burgers in Issaquah. Man that tasted so good! Below is a map of the route we took. I think it was a pretty sweet day and everyone else agreed. What a fantastic way to end the 2012 season!